What Are The Main Types of Tow Trucks? There is a wide variety of tow trucks used regularly in the U.S. and elsewhere around the world. There are many different models made by several manufacturers, some better known than others. In this blog post we’ll tell you a little about the different types of tow trucks, what categories tow trucks can be divided into, what kind of towing is best carried out with each type of tow truck and how you can tell if the tow truck being used to tow your car is the one suited for the job? It is true that there is a wide range of different tow trucks, each designed for a specific type of towing job, light duty local tows for instance or rather heavy duty towing of mobile homes, buses and trucks. There are also trucks especially suited for motorcycle, trucks used for long distance towing of two, three or even more vehicles at once etc. But there is a basic way to split all of these different types of tow trucks, each falling into one of two categories, dolly towing tow trucks or flatbed tow trucks. Dolly Tow trucks are ones where the vehicle being towed is lifted only on one end thus two of its wheels remain in contact with the road. With flatbed tow trucks the entire vehicle towed is loaded and secured onto a flatbed. There are times when dolly towing best fits the bill but generally speaking flatbed towing is considered the safest, fastest, most efficient method of towing. Many times the towing company can choose which tow truck to use for a particular job, other times a dolly tow truck just won’t cut it. For instance, when the vehicle in need of a tow is one which was badly damaged in a traffic accident or one with a broken axle. Motorcycles too can only be towed flatbed. Due to the indispensability of flatbed tow trucks any self respecting towing services provider will have at least one such truck at their disposal. Large towing companies which operate large fleets will most probably choose a ratio of 3:1. i.e. three flatbed tow trucks for each dolly tow truck. with tow trucks maintenance is a key issue. It does not matter what type of tow truck is in question, if it is not maintained properly it will become dangerous to use. Apart from regular maintenance, all types of tow trucks, dolly, flatbed, light duty, medium or heavy duty, tow trucks for local towing or ones for long distance towing, it is essential that they be fitted with all the necessary gear in order to allow the tow techs operating them to handle any type of tow for which the truck is intended for. 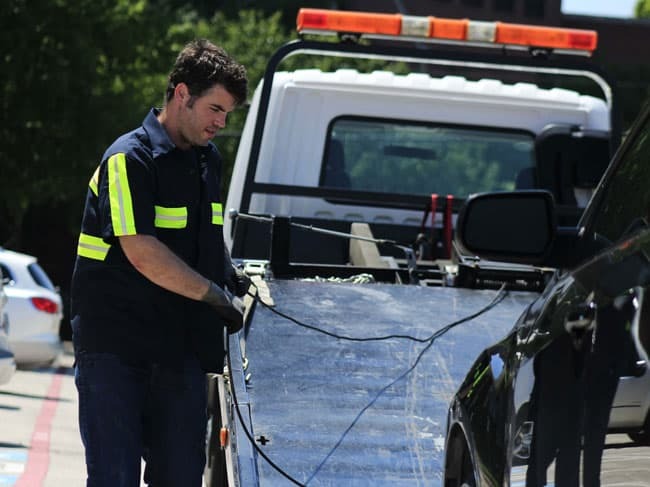 Even the most professional tow tech cannot perform a towing job properly if the tow truck they use is not a well maintained, fully equipped tow truck of the type suited for the job at hand.